While termites are commonly referred to as “white ants,” particularly throughout Australia, they are not related to ants – instead, they are part of the cockroach family Blattodea. Termites prefer to feed on dead plant material known as cellulose, usually in the form of leaf litter, soil, or wood. There are 2,600 taxonomically known termite species, but scientists estimate that the actual number of species is closer to 4,000. As pests, termites are of great economic significance since they harm crops and forests, and as they are capable of causing serious structural damage to wooden buildings. Like ants and bees, termites are eusocial insects. They participate in cooperative care of their young, they employ division of labor tactics, and one generation overlaps with the next. These are very busy insects – the problem is that rather than making honey like bees do, they’re often busy damaging valuable property. Almost all termites have similar life cycles. Each colony has only two active reproductive members; the king and queen. King and queen termites are fed by other members of the colony, and some have been known to live for more than 20 years. In laboratory conditions, queens have been shown to live up to 50 years, making them one of the longest-living known insects. Their sole purpose is to breed new termites, which they do at a rapid rate. A single mature queen is capable of laying thousands of eggs annually. Termite eggs have a two-week incubation period. During this time, worker termites tend the eggs carefully until nymphs emerge. The termite nymphs are then fed by attendants, which regurgitate food for them for a period of two weeks. After molting, the nymphs are transformed to workers, soldiers, or supplementary reproductives, or primary reproductive destined to become queens and kings. Reproductive termites are most physically advanced. They possess functional eyes, wings twice the length of their bodies, and either male or female reproductive organs. These termites remain within the colony for a time, eventually swarming out en masse. Termite swarms normally occur during the spring months, though they do sometimes swarm out in the autumn. Soldier termites are tasked with protecting the colony from ants and other enemies. They are easily identified by their stout armored heads and their menacing jaws. Some soldier termites have eyes; others are eyeless. Soldier termites are not capable of reproduction. Worker termites have the simplest body design. They are wingless, with a round yellowish-brown head and a white to greyish body. Worker termites have no eyes and like soldier termites, are sterile. How can you tell if you have a termite problem? One of the first methods for determining whether a termite infestation is present is to simply watch for termites. These insects are easy to identify, but it can be difficult to actually lay eyes on them since they rarely emerge from a food source once they begin tunneling through it. Subterranean Termites – There are three different castes within a Subterranean Termite colony. The workers are approximately six millimeters long. They have no wings and are light colored. The soldiers have long dark-colored heads equipped with sharp pincers, and like the workers, they have light colored abdomens. Reproductive Subterranean Termites have dark-colored bodies and are equipped with two pairs of wings. 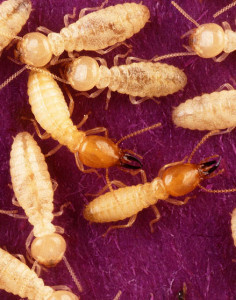 Drywood Termites – Drywood Termites are among the most destructive, usually causing serious damage before being detected, since established colonies can contain thousands of members. These termites are almost all two-toned, with white abdomens and dark colored heads with pincer-like mandibles. In their reproductive form, Drywood Termites have dark colored bodies and long wings that extend beyond the end of the abdomen. These termites live up to their name – they need very little moisture to thrive, and are most often found in areas where wood does not come into contact with the ground or receive moisture. Attic spaces are common Drywood Termite targets. Flying Termites – Flying Termites have a close resemblance to Flying Ants, however you can identify them by their waists, which are thicker and straighter than an ants’ waists are. You can also identify them by looking for two pairs of large, translucent, equal-sized wings. While ants have bent antennae, termites hold their antennae straight out from their heads. Flying termites are normally on the lookout for a new place to build a colony; once their mating flights have ended and they’ve settled into a new home, they shed their wings and start working to rear the next generation. There are many different signs of termites, and there are also a number of methods for preventing them and exterminating them. Termites cause billions of dollars-worth of damage in the United States every year. These insects are capable of destroying buildings at a surprisingly rapid rate – in fact, a colony with about 50,000 workers is capable of consuming a twelve-inch long two-by-four in the span of eight to nine weeks. In homes that are left untreated, total destruction occurs in an average of ten to fifteen years. If you believe you have a termite infestation, be sure to take it seriously.